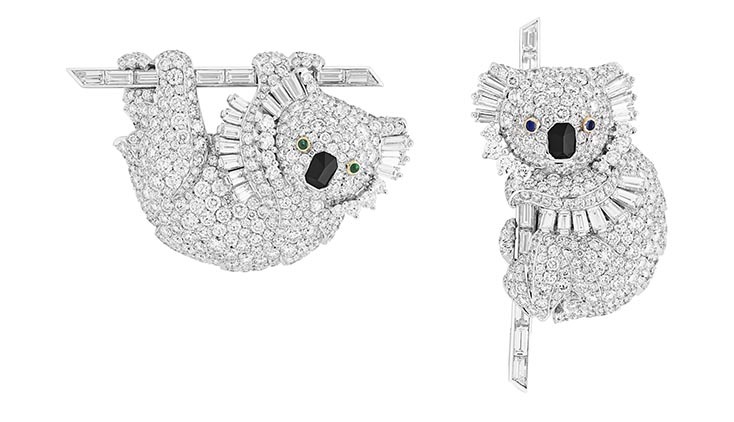 The installation of 'Noah's Ark Inspires Van Cleef & Arpels' is flanked by two pairs or brooches from the collection. 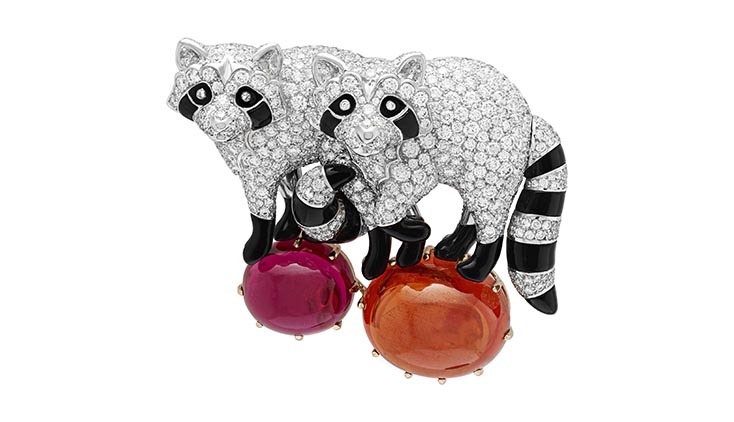 A Van Cleef & Arpels brooch with two diamond and onyx raccoons resting prowling over a 12.70-carat pink tourmaline and 36.26-carat spessartite garnet. 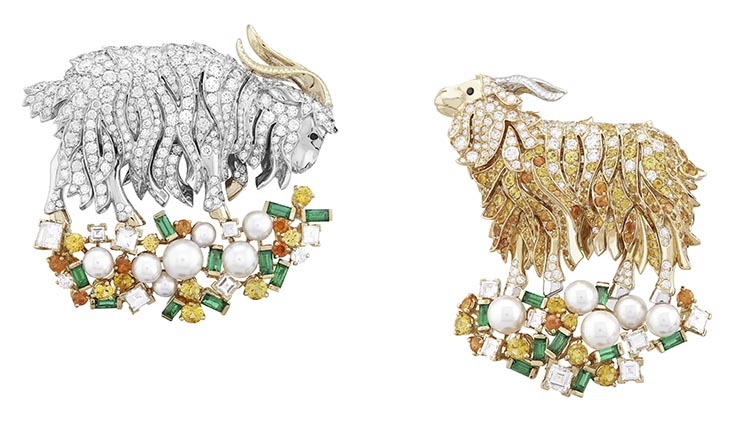 Darling donkeys, rascally raccoons, elegant owls and beautiful billy goats are part of the precious parade of Van Cleef & Arpels new High Jewelry collection. 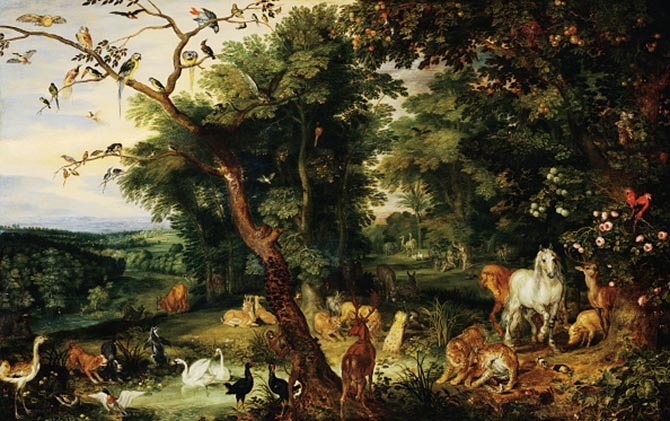 Created over a period of three years, the genesis for the idea started when the famous French jeweler’s president and CEO, Nicolas Bos, was taking a tour of the J. Paul Getty Museum in Los Angeles where he spotted a seventeenth century painting The Entry of the Animal’s on Noah’s Ark by Jan Brueghel the Elder. 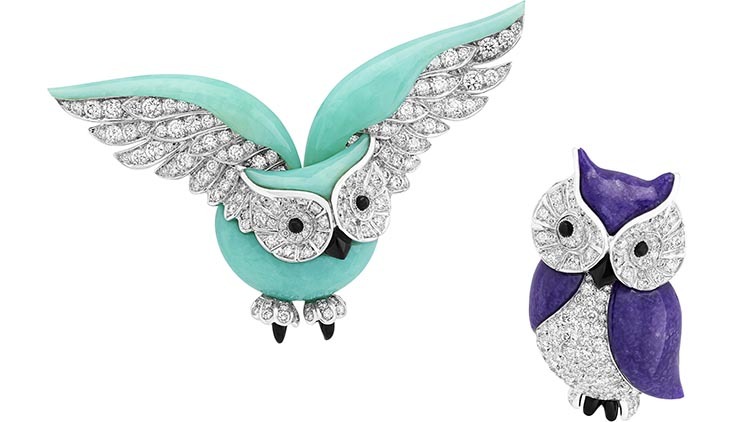 In order for the jewels to look like little works of art, every piece in Van Cleef’s collection was made into a brooch. 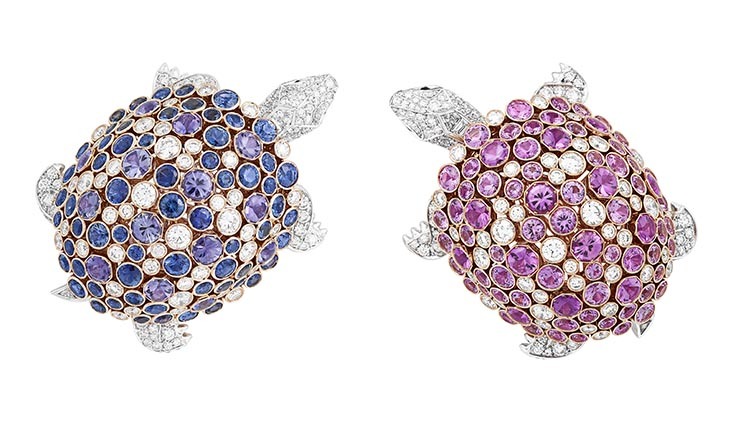 “When you create a necklace, bracelet earring or ring you see a piece of jewelry before you see the motif,” says Nicolas. 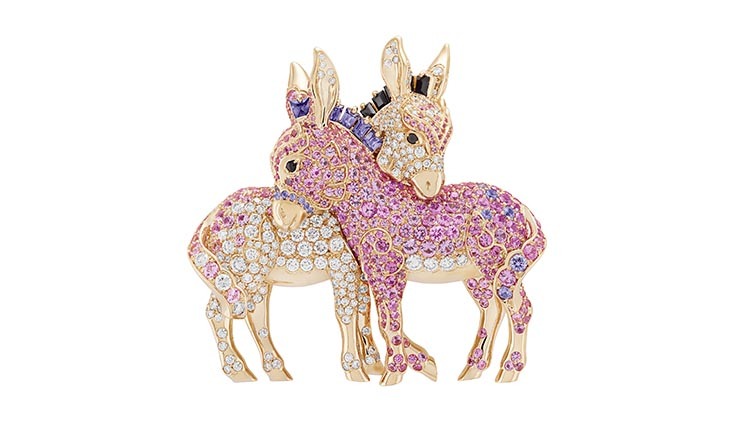 “For a brooch, you see a sculpture then you understand it can be worn as brooch.” Each piece was carefully crafted by artisans in the jeweler’s workshop in Paris to express the individuality and personality for every animal. 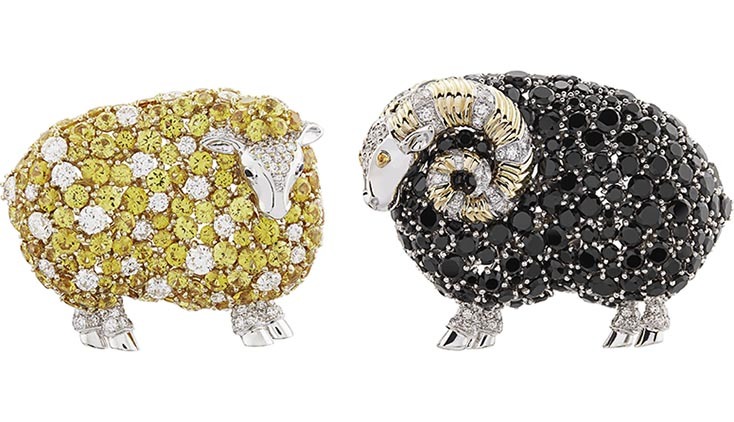 “Some are elegant and gracious, others are naïve, some have a sense of humor,” says Nicolas. 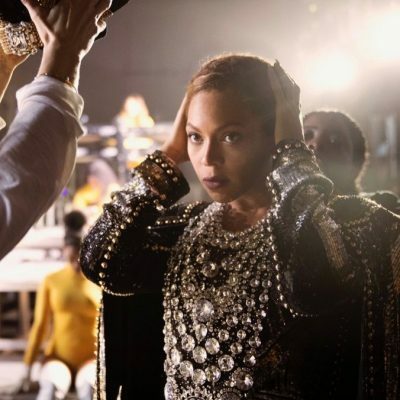 To share the unique presentation with clients and the public, Bos engaged theater director and visual artist Robert Wilson to build an ark and display for the jewels. “From the origin my, dream of the collection was to work with Bob because of his proximity to the great stories and texts,” says Nicolas. 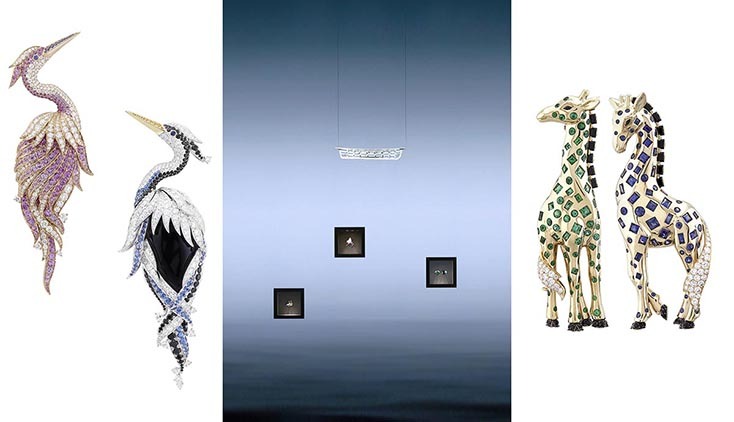 “Noah’s Ark Inspires Van Cleef & Arpels” features a little ark suspended above a room with mesh walls covered in light displays of rolling waves and little vitrines housing each pair of animals. The opening passage of Spiegel im Spiegel by Arvo Pärt for piano and violin is the moody music that plays for long stretches between dramatic clashes of thunder and lightning. 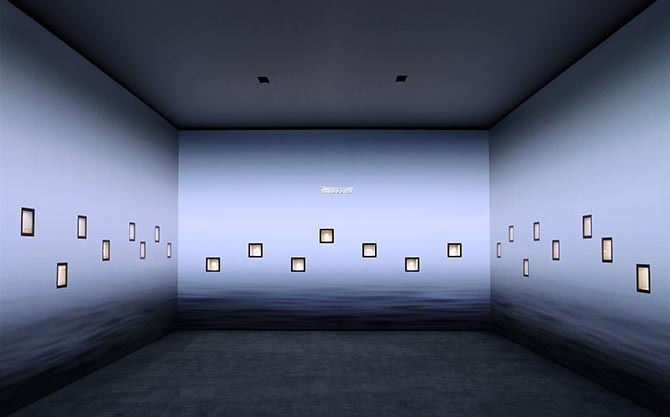 The exhibition has delighted visitors in Paris and Hong Kong over the course of the last year. 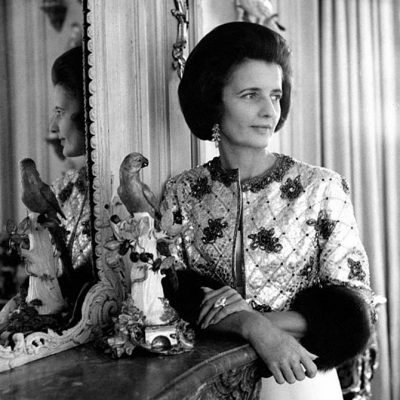 It is on display in New York at the Cedar Lake located at 547 West Twenty-sixth Street until November 19, 2017.